I received a very nice belated birthday present from RC this weekend – The Williams-Sonoma Cookbook. It is a beautiful book with more than 370 recipes. 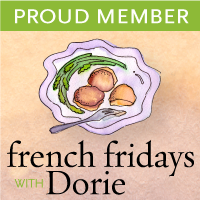 I love that there is a picture for every recipe and each page has, in the sidebar, a tip or a fact about one of the ingredients in that recipe. This gift came in perfect timing as I’ve lost all enthusiasm for cooking after a long holiday in Malaysia where good food was everywhere and easily obtainable! 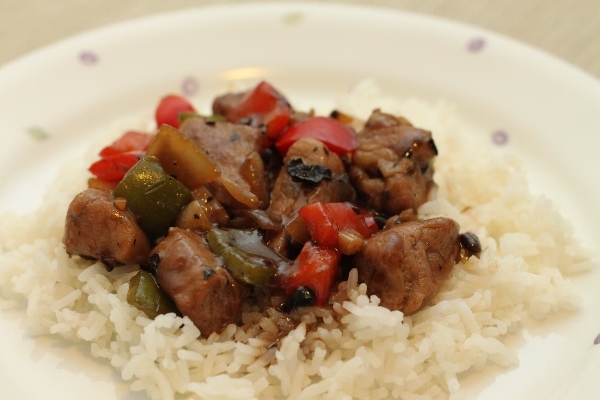 My inaugural recipe from this book was Stir-fried Pork in Black Bean Sauce. It’s a Chinese recipe and it’s ironical that I’m learning to cook this dish from a Western cookbook. 😉 It’s not so much the seasoning to use but the steps in cooking the dish that I need to learn. This is a tasty dish, thanks to the fermented black beans. I didn’t care much for the taste of the pork (gamey) and I’ll make this dish with chicken next time. Cut the pork into bite-size cubes. 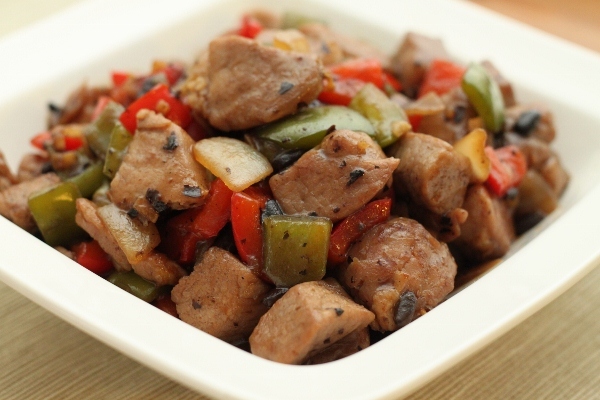 In a bowl, combine the pork, baking soda, 1/4 tsp sugar, 1/4 tsp salt, 1/8 tsp white pepper, and 2 tbsp water and mix well. Cover and marinate in the refrigerator for at least 1 hour or up to 3 hours. To make the sauce, stir together the black beans, oyster sauce, soy sauce, sesame oil, 1 tsp sugar, cornstarch, 1/8 tsp white pepper, and 1/4 cup water in a bowl. Set aside. In a wok or large saute pan over high heat, heat 1 tbsp oil until almost smoking. Add the garlic and ginger and fry till fragrant, about 5 seconds. Add the onion and bell peppers and stir-fry until just tender, about 5 minutes. Add the rice wine and deglaze the pan, stirring to scrape up any brown bits from the pan bottom. When the wine has nearly evaporated, transfer the vegetables to a bowl. Remove the pork cubes from the marinade and place on paper towels to drain. Return the pan to high heat and add 1 tbsp oil when the pan is very hot. When the oil is hot, add the pork and stir-fry until it browns and turns opaque, about 3 minutes. 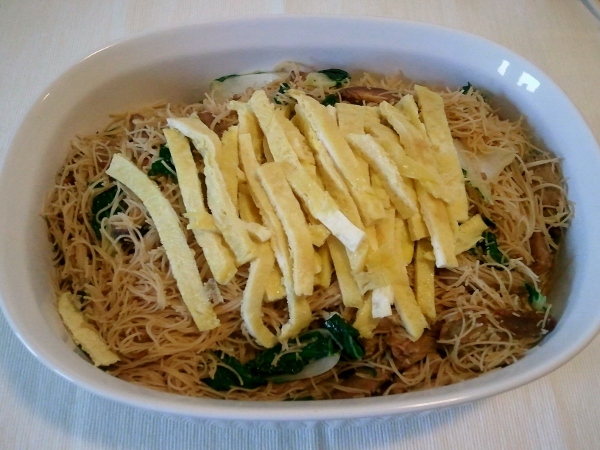 Return the cooked vegetables, add the sauce and stir-fry rapidly until the sauce thickens and the mixture is heated through, about 5 minutes. Transfer the pork mixture to a warmed platter, garnish with cilantro sprigs (optional), and serve with the rice. 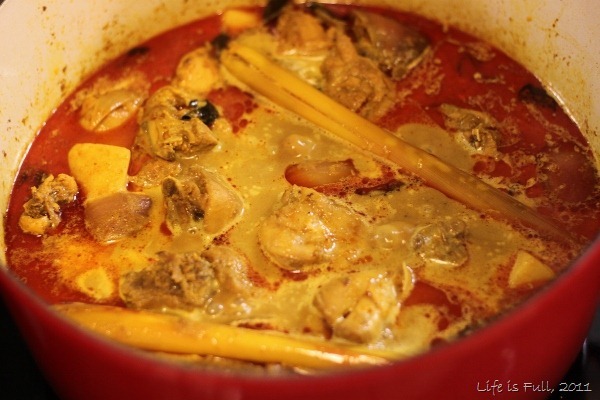 Chicken curry ranks right up there when you’re talking about popular Malaysian cuisine. 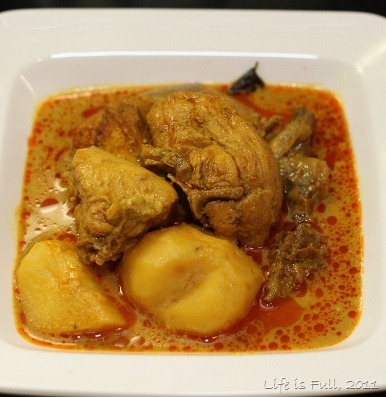 In almost every potluck or party, chicken curry, with or without potatoes, will be there. It’s a time-consuming dish to make if you’re making it from scratch. There are spices to pound or grind before cooking them till the spices turn into a fragrant paste. The paste is the all-important base of the curry. Needless to say, I’ve never attempted to make it from scratch. Nowadays, we have the convenience of packaged curry paste. However, Malaysian curry paste wasn’t available in supermarkets here till a few years ago. I’m very glad T & T brings in Tean’s Chicken Curry Paste. It’s delicious and authentic, no more missing chicken curry from home! I add in lemon grass and curry leaves for extra flavour. 1. Marinade the chicken with the curry powder and salt for at least an hour. 2. Heat some oil in a Dutch oven or a wok and stir-fry the curry paste and potatoes for 5 minutes. 3. Add in the marinated chicken and cook till the chicken is cooked on the outside. This is to seal in the chicken juices. 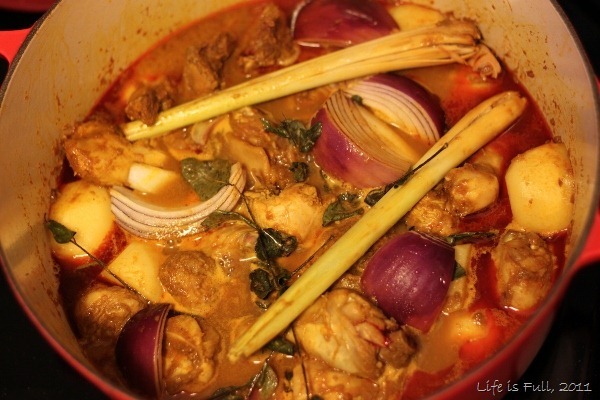 4.Add in the onions, lemon grass, curry leaves and water. The water should just cover the chicken and potatoes. 5. Bring to a boil, cover, reduce the heat and simmer for 25 to 30 minutes until the chicken is cooked through and the potatoes are tender. 6. Add in the coconut milk and simmer for another 10 minutes. 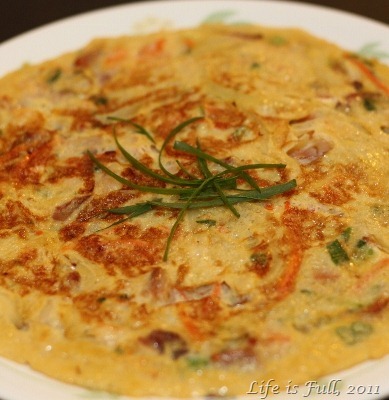 The coconut milk is added only at the end as the flavour of the coconut milk will be cooked away if added too early. Taste and season with salt if necessary. 7. 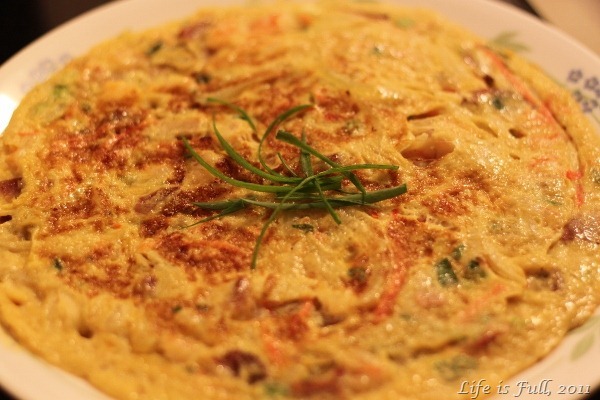 Serve with white rice or roti paratha (flat bread). ** The salt can be omitted if you want to reduce the salt content in this dish. 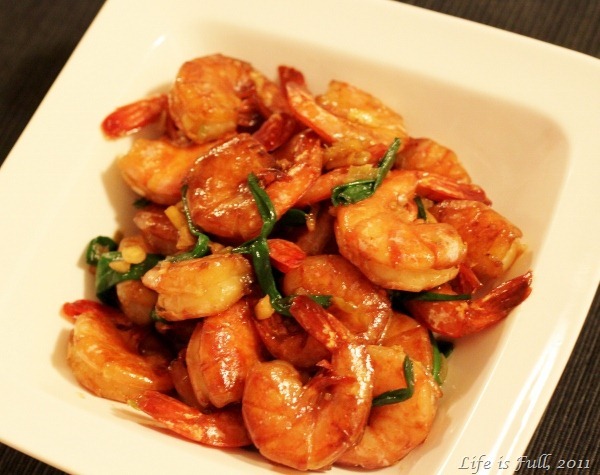 My family loves shrimps and I usually cook a sweet and sour version of it. 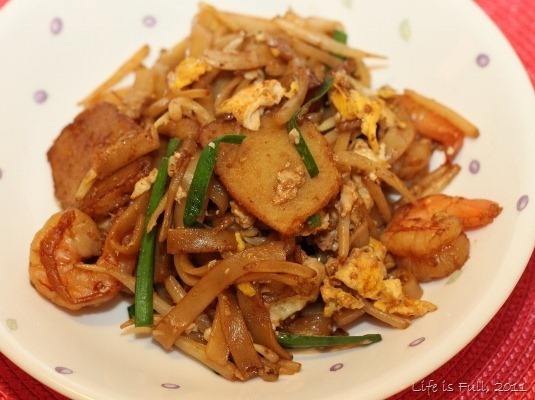 Kitchen Flavours has an oyster sauce version on her blog and I gave it a try the other night. 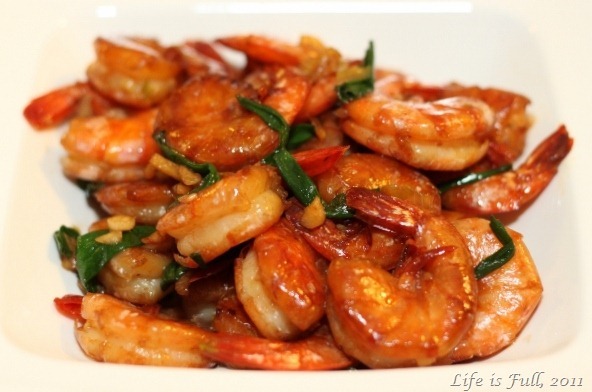 Her recipe uses 600gm of shrimps (or prawns) but I had less so I adapted the recipe and reduced the ingredients. This is another tasty dish. The green onions are a good addition. Use a big bunch for more flavour and colour. Visit Kitchen Flavour’s blog for the cooking instructions. 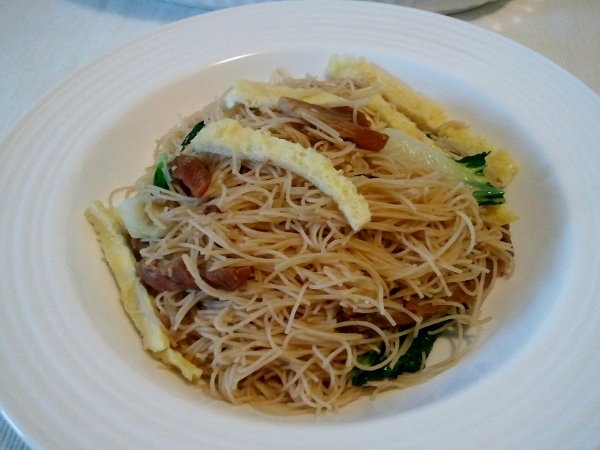 We had ‘Yee Sang’ at RC’s house today together with her family. 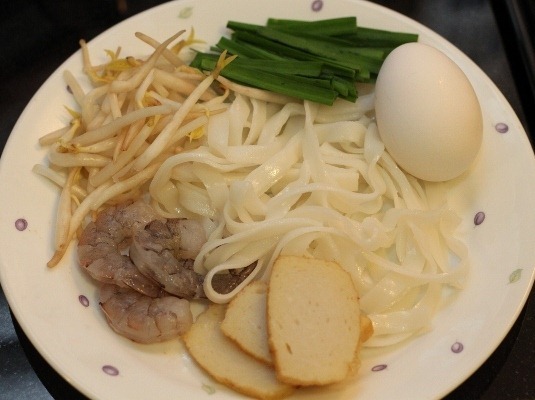 She makes this every year as part of the Chinese New Year (CNY) festivities and traditions. 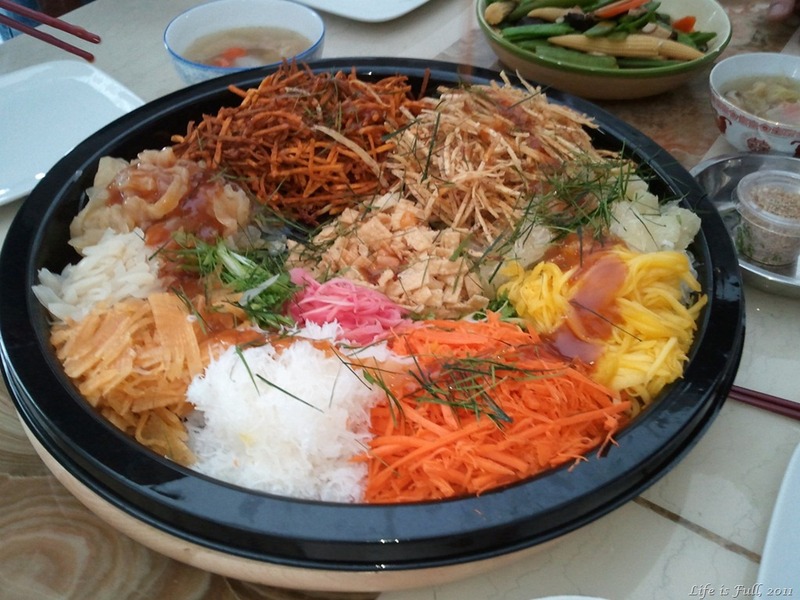 ‘Yee Sang’ is a salad made of shredded vegetables and mixed with some condiments and plum sauce. Slices of raw salmon or other kinds of fish is commonly added to the mix. 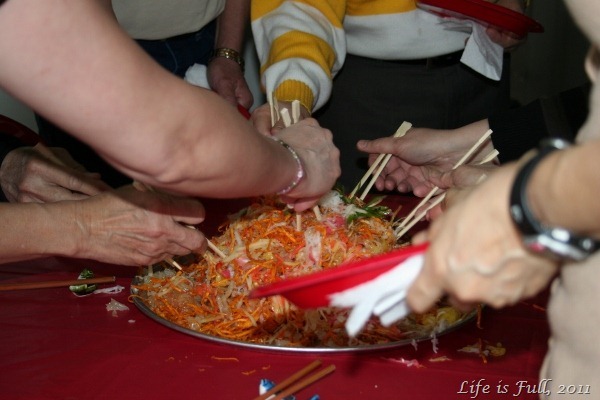 After the sauce has been poured over, everyone at the table picks up his or her chopsticks and begin tossing the salad to mix it up, the ‘Prosperity Toss’. This is a shot of the toss during last CNY, again at RC’s house. She had more people over then. Before coming to Canada, I didn’t know Yee Sang is a CNY tradition only in Malaysia and Singapore. The Chinese restaurants here don’t serve or sell this. 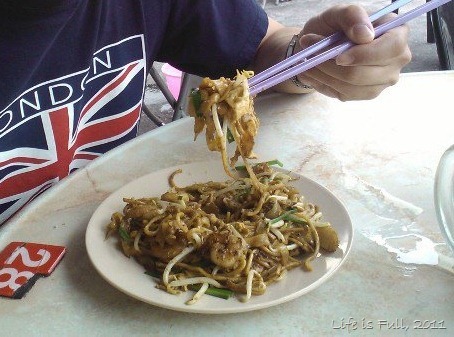 I heard that a Malaysian restaurant in Markham makes this but it’s selling for $100 a dish and upwards. I suppose it has a high price tag for a salad because it’s a labour-intensive dish but still…! RC prepares this dish all by herself, shredding and slicing the vegetables and deep-frying the shredded yam and sweet potato. Even the sauce is homemade! If not for RC, I wouldn’t be able to having Yee Sang during CNY. Thank you, RC!